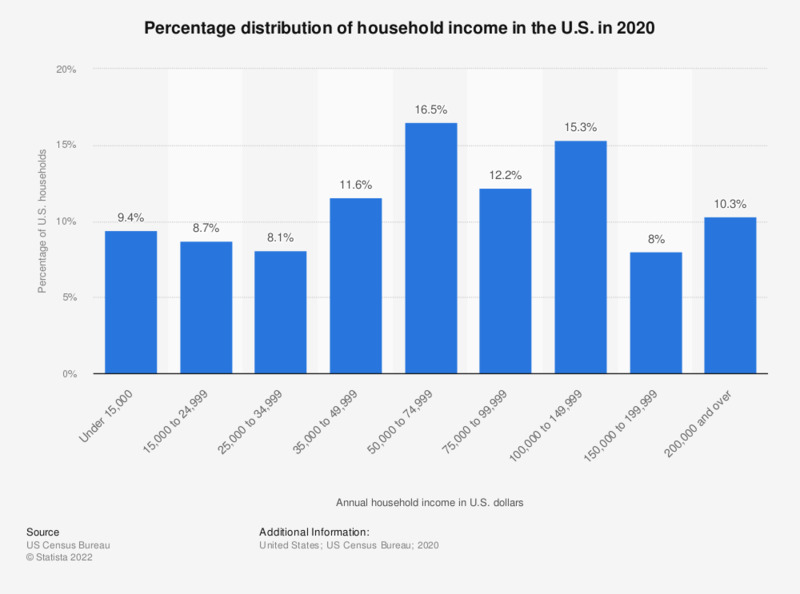 The statistic shows the percentage distribution of household income in the United States in 2017. In 2017, 12.3 percent of U.S. private households had an annual income between 35,000 and 49,999 U.S. dollars. The largest proportion of citizens, at 16.7 percent, earn an annual household income between 50,000 to 74,999 U.S. dollars. Household income in the United States can be used to track economic status and trends across the country. After the economic recession in 2009, the distribution of household incomes has become more unequal and has made income inequality more prominent across many metropolitan areas. Household incomes can also determine if an individual is eligible for certain programs like college financial aid. Between 2000 and 2010, the poverty rate in the U.S. has increased steadily; however, in the recent years there is a trend of poverty decline among U.S. population, reaching 12.3 percent in 2017. About 10.7 percent of households currently earn less than 15,000 U.S. dollars annually. Based on a four-person household in the United States, earning less than 23,492 U.S. dollars annually would put a family under the poverty threshold. Some 24.4 million households currently live under 25,000 U.S. dollars per year . About a quarter of both the total Black and Hispanic populations were living below the poverty line in 2017. Income refers to money income before tax. A detailed explanation of the measurement of income can be found on page 21 of the report.